The M Equipment made several small but important upgrades to create the Meidjo 2.1 last winter and these changes have made a great binding even better. We have sold a lot of the Meidjo 2.1 bindings and can safely say that these are robust and reliable and an excellent choice whether for resort use and touring. 1 - The new "winged" heel unit has been modified to prevent snow build-up, has been strengthend and has a stronger spring with a very positive ski/walk action. The "wings" allow the heel unit to be lifted with the ski poles. 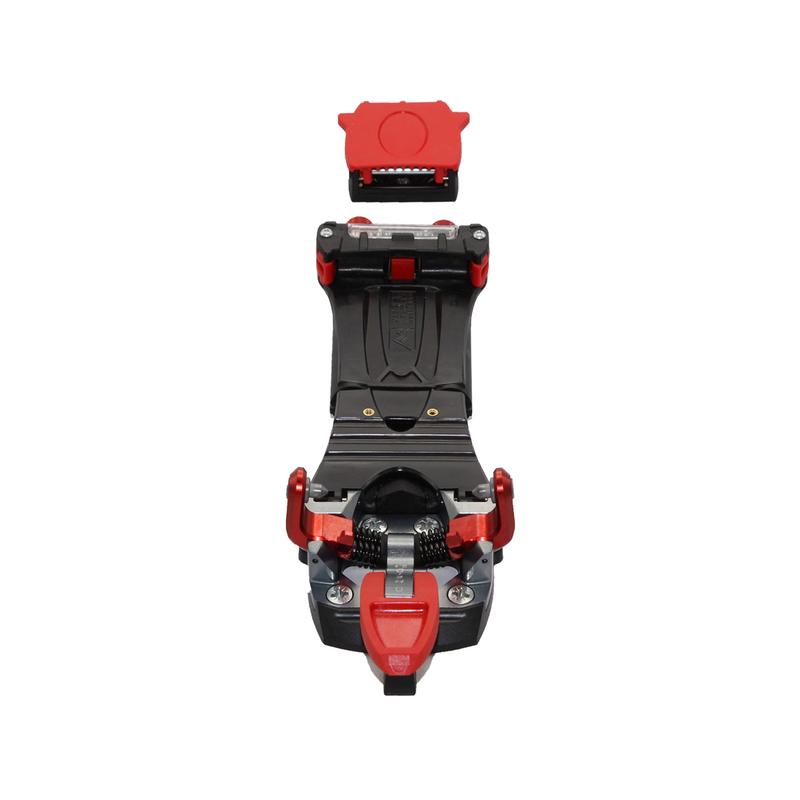 2 - The profile of the spring box has been modified to give smoother lateral release and make it even easier to remove the boot from the binding when you stop skiing. 3 - Snow accumulation under the flextor plate has been almost completely eliminated thanks to the new plastic protective housing that covers all metal parts under the flextor plate and helps evacuate snow. 4 - The new mounting design uses a reinforced metal baseplate that evenly distributes pressure and avoids screws ripping out of lighter touring skis. The new design has almost completely reduced snow build up under the flextor plate / spring box but this can still happen in some snow conditions. We recommend covering all metal surfaces of the rear baseplate with duct tape to prevent snow sticking. We've found that applying liquid wax (eg Swix F4 liquid) to this area helps to almost completely resolve this problem. We use the Meidjos on almost all our test skis and have found that spring tension and the choice of springs is very important. Depending upon the skier's style and the ski characteristics, different springs dramatically affect how the skis perform. For offpiste use and touring for most skiers we recommend the standard springs, but for getting the most out of slalom skis, and skis with stiff tails the standard springs are too soft, and you'll need the redline springs, or the small internal springs, or both! The stiffer springs delivery much more power to the ski, and a lot more pressure to the tail. It's pretty interesting how the springs change the performance of the bindings, and well worth experimenting with. The stiffer springs also let you ski with a higher stance while still driving the skis effectively. The Meidjos allow almost as much forward flex as the 75 mm bindings while offering much more precise control and feedback, and this ability to vary skiing style makes modern telemarking technically even more interesting than it was on the "old days"!! You can also adjust binding response by adjusting the initial pressuure of the springs by tightening or loosening the red Spring Retainer Nuts. Tightening these increases binding response while loosening them will provide a gentler but less dynamic turn initiation. The M Equipment supply a full range of accessories for the Meidjo 2.1 bindings. For tourers the handy ski crampon slot is a minimalist marvel that is compatible with Dynafit ski crampons. Optional ski brakes are available with widths of 85-130 mm. Should you prefer an alpine level of control when tired or when conditions get difficult, the Alpine Heel Unit lets you block the heel down if you're using Crispi boots (or the older versions of the Scarpa and Scott NTN boots). The Meidjo 2.1 is the most advanced telemark binding available and is the "go-to" binding for freeheel resort or backcountry skiing.